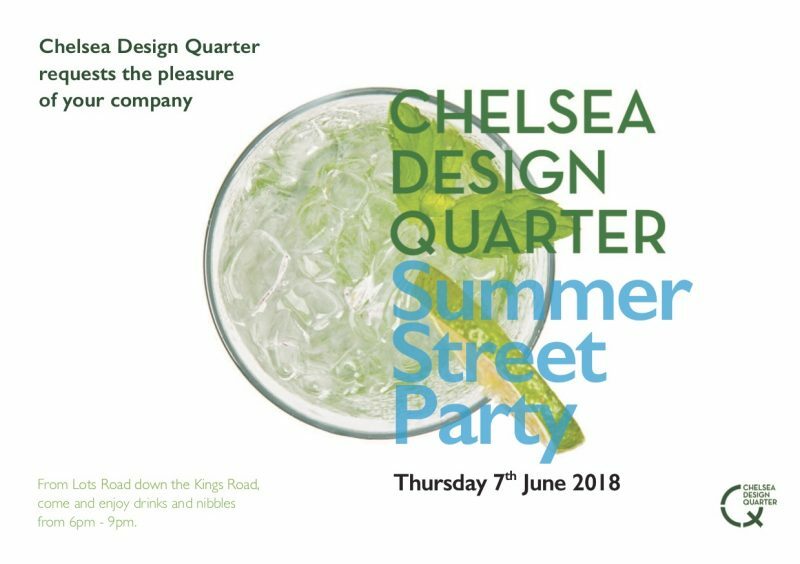 It’s that time of the year again Chelsea Design Quarter‘s (CDQ) annual Summer Street Party takes place on Thursday 7th June between 6-9pm. The hub of the party runs from Lots Road to Kings Road (Fulham Broadway end) and all participating showrooms will be open late. Enjoy street food and entertainment and soak up the atmosphere whilst you browse the wide variety of interiors businesses the area has to offer. 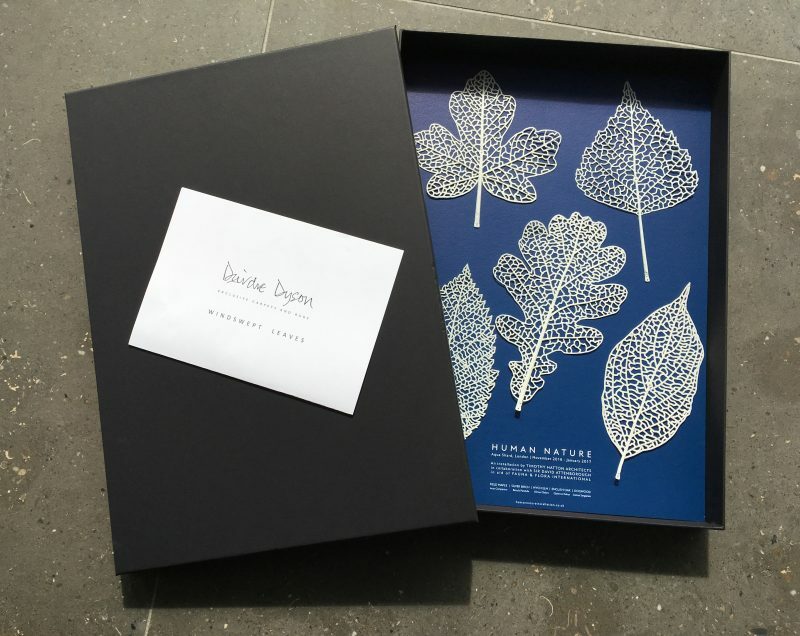 We’ll be offering guests a glass of Champagne whilst you browse the gallery and the chance to win a unique box set of 3D printed leaves designed by Architect Timothy Hatton in our prize draw. These wonderful 3D printed leaves were originally produced for Tim Hatton’s Human Nature installation at Aqua Shard in December 2016, to enter simply pop your business card in the bowl in our gallery and one lucky winner will be drawn at random. CDQ has over 30 member showrooms covering rugs and lighting, fabrics and furniture, kitchens and bathrooms, antiques and collectibles, prints and paintings and bespoke galore. Classic and traditional sit cheek by jowl with contemporary and modern – the Summer Street Party is the ideal time to explore this interiors enclave! Follow @ChelseaQuarter for more information. DEIRDRE DYSON IN CONVERSATION – FULLY BOOKED! 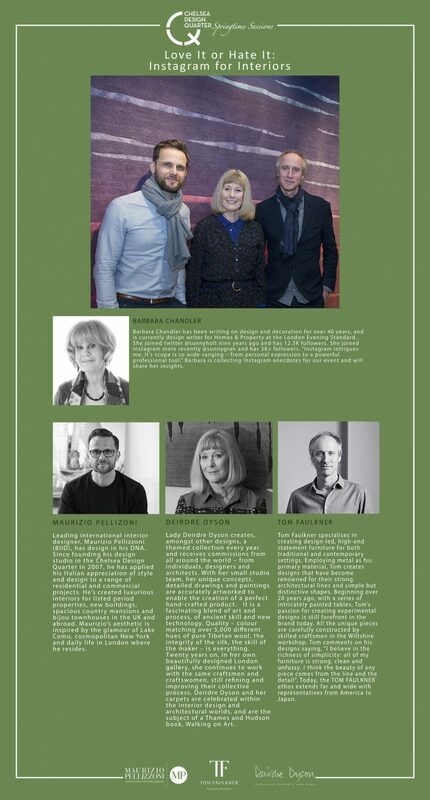 Other Chelsea Design Quarter Springtime Sessions Talks do still have available places, see the CDQ website for details. We are extremely excited to reveal all nine new designs in Deirdre’s collection for 2016 Walking on Art. 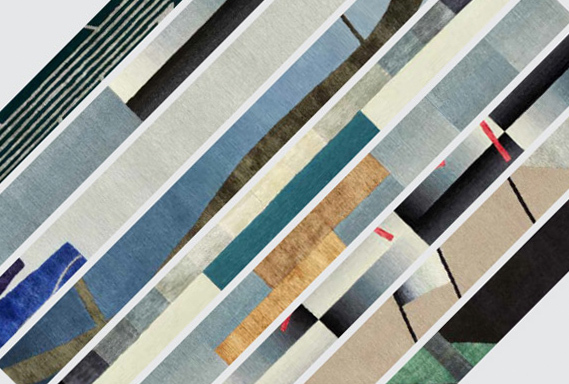 The collection has been called after Deirdre’s book of the same name detailing her evolution from fine artist to carpet designer, the design process itself and also catalogues all her carpet designs, together with a substantial number of background sketches and drawings, from the past fifteen years. All the new designs are hand-knotted in wool and silk and to a greater or lesser extent include grading which requires not only Deirdre’s singular talent for colour selection in the design, but also the hugely skilled craftsmanship of our artisan weavers in Nepal. See us on Stand G34, Hall 7 from Thursday 22nd to Tuesday 26th January, Maison et Objet Parc des Expositions, Villepinte, Paris.